A Metairie developer has chosen a new location in eastern New Orleans for Grand Theatre Megaplex, a 17-screen, 75,000-square-foot complex that will feature a unique theatre configuration. Haman Higgins III, doing business as Wiser Development Group, said the $14 million cinema will feature stadium seating in curved rows facing a concave screen set in the corner of the theater. This design is dubbed "stealth seating" because it lets theater operators place more seats in the middle of a theater to provide better views, said project architect Hank Smith of Harry Baker Smith Architects II, which also will serve as construction manager. Higgins said he has a contract to buy 16 acres at the corner of Interstate 10 and Louisiana 47 from Boh Bros. Construction Co. and Lake Forest Inc. He did not disclose the price. His contract contains an option to buy another 35 adjoining acres, where he plans for a 105-room, $8 million Hawthorn Hotel and may build a large water park. The water park, if built, could be the first in the metropolitan area. No details were available, but water parks typically charge a daily entrance fee and feature elaborate swimming pools with wave machines, water slides and lagoons for lazing in inner tubes. The closest water park is Blue Bayou Water Park near Baton Rouge. Jazzland Theme Park, scheduled to open in May, might later add a water park. Higgins has scaled down his original theater plans from 25 screens to 17. He said the change will allow easier access, and avoids costly construction for access roads. The new location is on the lake side of Interstate 10. The previous plan was on the river side. In an earlier proposal, Higgins said, state Rep. Sherman Copelin, D-New Orleans, was involved in the project. Copelin is not involved in the revised project, Higgins said. 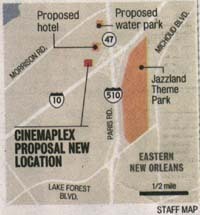 Grand Theatre will be near Jazzland Theme Park. Higgins said construction could begin in October or November. He provided no timetable for the hotel or water park. As for the new theaters, why call it stealth seating? "In a way, it clandestinely has more seats in the prime viewing area," said architect Smith. "When you walk into the theater, you don't really notice that." The concave screen is smaller than screens in some cinemas, but it's curve gives movie-goers at the ends of rows more viewing image, Smith said. "It allows for the perimeter seats to see more of the movie," Smith said. The exterior of the theater will feature four large columns that will beam light into the night sky, Smith said. Economics and the opportunity for a better location drove Higgins' decision to relocate and scale down original plans, he said. He declined to name other local partners but said 30 percent of the complex will be financed through loans. 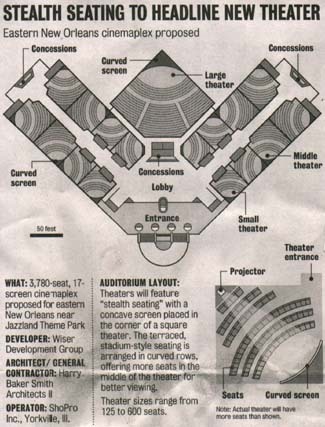 The 17-screen cinema would have 3,780 seats, including one 600-seat theater surrounded by eight smaller theaters on each side. Those theaters would range from 125 to 300 seats. Eric Lassair, doing business as Telejacks and Things, will serve as general contractor. The theater will be managed by ShoPro Inc. of Yorkville, Ill. Albert Kolkmeyer, president of ShoPro, did not return phone calls Tuesday.